Passion in and of itself does not sustain the ‘call’, no matter what the call is. For me, the call is salvation of souls and justice for the oppressed, but it could easily be a thriving church, a profitable business, ministry to unreached people groups, or something entirely different for someone who is driven by whatever else under the sun. Regardless of what it is, passion for that thing is not enough to sustain your ability to pursue it. There are several reasons why passion does not sustain but the two that come to mind most often for me are these: (1) we as humans are weak and we get easily tired, beat up, downtrodden, exhausted, etc, etc no matter how good our intentions are. When we see enough hardship, encounter one to many obstacles, or just had a bad day, we throw in the towel, say its not worth it, and render ourselves to something not so difficult. This is not something to beat ourselves up over, it is what it is, part of the human condition (2) we get easily sidetracked, meaning we can easily be lead astray away from the goal. Either something else comes along that is much more appealing or promising, or we begin to compromise our passion bit by bit as we try to accomplish it in ways that are not pleasing to God. So if the call cannot be sustained by passion on its own, how do we do it? How do I keep the zeal for people fresh and the passion for justice alive without getting fatigued or sidetracked? How do we keep our families and our marriages strong without abandoning them when the going gets tough? How do we keep at it in our businesses, workplaces, schooling or whatever else without getting tired as a result of little promise of return? By attaining accuracy. 1. An accurate view of God: It all starts with an accurate view of God, the one who gives the passion for the call in the first place. This means that the call must be bigger than oneself and be able to reach out beyond ones abilities, giftings, talents, resources, and time. I believe that we can question whether our call is of the Lord or not, when we know that we can accomplish it in our own strength without His help. When we can do such, the call often has nothing to do with Him or is not big enough for Him to move and bring glory and honor to His name. Isaiah 6, one of my favorite passages of scripture, starts off as this: In the year that King Uzziah died, I saw the Lord lofty and exalted, with the train of his robe filling the temple. For me, this means that when King Uzziah died Isaiah finally saw the Lord for all that He was. It was not that he had never seen Him before, because he probably already had some sort of relationship with Him. But it was at this moment that he finally got an accurate vision of God. And this is important because it allowed Isaiah to get a better understanding of something else: himself. 2. An accurate view of self: The passage says that when Isaiah saw the Lord for who He was, he saw himself for all of his sin, limitations and inadequacies. ‘Woe is me, for I am ruined! Because I am a man of unclean lips, and I live among a people of unclean lips; for my eyes have seen the King, the LORD of hosts” (Isaiah 6.5, NASB). The text does not tell us what Isaiah thought of himself before this, but if he was anything like the rest of us, I am sure he thought of himself all too highly. He probably did not recognize that he was not that good looking, probably did not think that his breath smelled all too badly, probably did not think that he was not as smart as he thought he was. But now, as a result of seeing God, he sees himself and it is not good. I am so glad that God does not stop at letting Isaiah get an accurate view of himself. Instead, of leaving him in the muck and mire of his new reality, He makes him clean. He purifies him and says, “you iniquity is taken away and your sin forgiven” (Isaiah 6.7, NASB). Absolutely refreshing. Now he is ready to be set apart. 3. An accurate view of the world (or the situation at hand): It is only after Isaiah sees God for who he is, and sees himself for who he is (and is forgiven) that he can see the world for what it is. 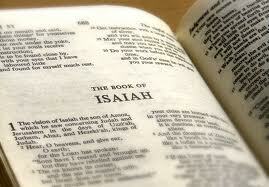 The scripture passage says upon hearing the need, Isaiah asked God to send himself as a witness to the people. And even though he knew that it would not be easy, I mean the Lord told him so himself, Isaiah went. He knew that he could face danger. He knew that the people would not listen. He knew that their hearts would be hardened toward the message. But he went. And while going, he did not give up. He did not throw in the towel. He did not change directions. Why? Because his call was fueled by something else than passion; I am sure there were times that he just did not feel too passionate. Instead, it was fueled by accuracy: that of God, that of self, that of the world. That is how we sustain it.